【日本語訳付き】Peppa Pig フレーズ集　Polly Parrot 編 | English Culture for Kids! Granny: We have a new pet. Can you guess what it is? 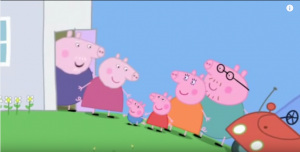 Peppa: Mommy, why does Polly copy everything that Granny says? Your little sister is trying to copy you. Are you pretending to sleep? I am pretending to be a parrot. Peppa: Granny, please can we leave the table and go and see Polly parrot? Peppa: Granny Pig! Grandpa Pig! Granny: Hello my little ones. Come inside. We have a surprise. Grandpa: No, it’s not a dinosaur. Come and see. Narration: Granny Pig and Grandpa Pig have a pet parrot. Granny: Peppa, George, this is our pet parrot. She’s called Polly. Pretty Polly. Granny: I’m a clever parrot. Polly: I’m a clever parrot. Mommy: That’s what parrots do. I’ll show you. Hello Polly. Mommy: What a sweet little parrot. Polly: What a sweet little parrot. Granny: Come on everyone. Tea time. Peppa, George, come on. There’s chocolate cake. 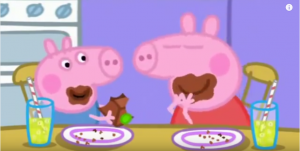 Narration: Peppa and George love eating chocolate cake, but today they are in a hurry to get back and play with Polly parrot. Granny: What noisy little ones you are. Granny: Are you sure you’ve completely finished your cake? Off you go then. Peppa: George, say something to Polly. Narration: George is a little bit shy. 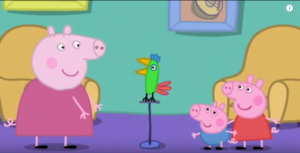 Narration: Peppa and George are really enjoying playing with Polly parrot. Narration: Peppa and George are pretending to be parrots. Narration: Peppa is thinking of something else to say to Polly parrot. Peppa: I’m a noisy parrot. Polly: I’m a noisy parrot. Granny: Peppa, George, have you been playing with Polly? Granny: Polly is such a sweet parrot. Polly: I’m a noisy parrot. I’m a noisy parrot.